With high pressure jet rodding we clear your Gold Coast drains fast without any damage. We can event prevent further blockages! Replacing a Gold Coast leaking roof is extremely expensive and must always be the absolute last resort. Preventative maintenance of any roof will always give you peace of mind with a combination of repairs and ongoing maintenance. It’s important to remember that a roof leak can be occurring in multiple areas of a roof so repairing any roof leak is a process of elimination. 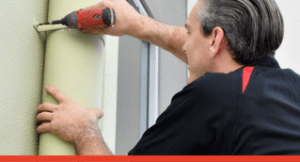 Roof ventilation fan installations stop you feeling summer heat extremes in your home. This is an absolute guarantee by Whywait Plumbing when we install a SolarArk solar powered roof ventilation fan system in your home. In fact, in the middle of summer on the Gold Coast, it can reduce the temperature in your roof space which is the area between your roof and ceiling, by 30°C which translates to a reduction in room temperature inside your home of up to 6°C. Imagine the difference this makes to the efficiency, performance and electricity costs of your air conditioning systems. 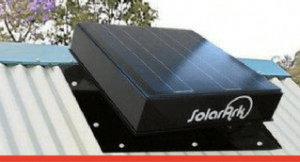 The installation of one or more SolarArk roof ventilation systems continuously exchanges the hot roof space air to suppress ongoing heat buildup during the day. During the summer months especially but even year-round your roof attracts the sun’s heat transferring that heat through your roof and super heating the air in the roof space. This then transfers into heating up the inside of your home and increasing the temperature in your living areas. The roof over your head is critical infrastructure in any home. Unfortunately, the roof and the guttering on the house are taken for granted, until they leak. A Gold Coast leaking roof can start as a small problem that appears to go away, as soon as the rain stops. That is of course until we get summer storms and heavy rain. A leaking roof will never go away and can quickly turn into a major disaster. What starts off as a few drops of water on the ceiling or through a light fitting can quickly turn into major property damage with a ceiling collapsing. If you notice water coming through the ceiling, then you have a potentially major problem. A Gold Coast leaking roof is not a DIY repair. Despite what many people think you seldom can fix a leaking roof by squirting silicon everywhere. A leaking roof required experienced plumbers who know how to walk on a roof and what to look for. A ceiling collapsing due to the influx of rainwater in a storm can cause thousands of dollars of damage and can cost even more to repair. Even worse is the loss of valuable, treasured personal items that are destroyed by water damage.